The revised proposals follow detailed discussions with the City of Edinburgh Council’s planning team after the main planning application was submitted in August this year. Drum’s £50 million proposal for the 2.9-acre Stead’s Place site, near the foot of Leith Walk, is for a mixed-used scheme combining high quality, affordable housing for local people and post-graduate student accommodation - as well as a hotel, restaurant, café and retail units. a dedicated three-metre wide cycle/pedestrian route connecting to Pilrig Park, with 110 cycle spaces. 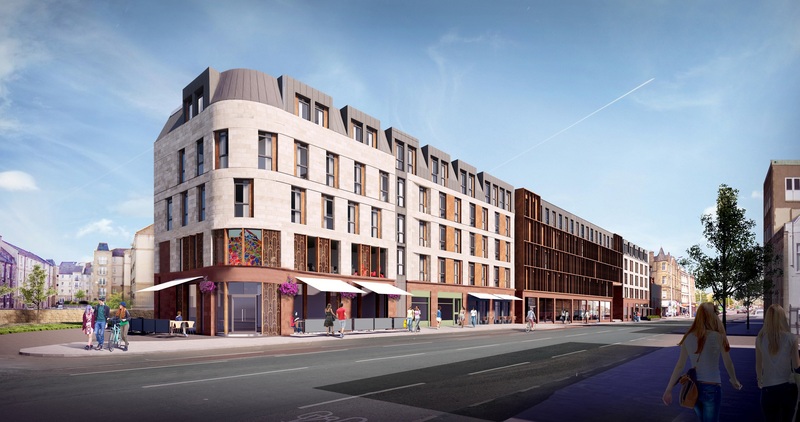 Welcoming the revised design proposals, Graeme Bone, group managing director of Drum, said: “This has been a very high profile planning application and one that, if approved, will have a significant and positive impact on Leith Walk, and how it connects with the rest of the city. “As such, we have worked closely with the council’s planning team following the initial submission and now have a design which reflects their input and feedback from the local community. “By reducing the height of the building facing on to Leith Walk and the number of student rooms, we have a design which is more sympathetic to the building heights and front-facing facades of the surrounding tenements in the immediate local area. “The clear distinction at ground floor level of the sandstone retail units from the residential accommodation above is more in keeping with the rest of the tenement buildings on the street. And the rounded corner of the building with its first floor feature windows, offers the opportunity for eye-catching artwork in a highly visible location. It is expected that the revised planning application will be discussed at the City of Edinburgh Council’s planning committee early in the New Year.